Hockey East’s coaches have picked the Terriers to repeat as conference champions this season. The coaches poll, announced during Media Day today at Boston’s TD Garden, gave BU six of 10 first-place votes, with BC and Lowell each receiving two votes. Last season, the Terriers won the conference championship for the seventh time and the regular season title for the eighth time. Assistant captain and top returning scorer Nick Bonino (photo), speaking to New England Hockey Journal's Andrew Merritt, stressed the importance of putting last year’s championship in the rear-view mirror and focusing on the present. "Our biggest question will be whether the freshmen coming in can step up and add a little bit to the offense, and secondly how much of a jump will our sophomores make." Blog contributor buoldtimer attended Media Day and will have a report on his observations there. Check back tomorrow. Nine regular season BU games will be telecast on ESPNU and NESN this season, beginning with the home opener against Notre Dame. For the composite Hockey East TV schedule, click here. Most Terrier home games will be broadcast online through the All-Access service. We'll post details and subscription costs as they become available. A few days ago we reported that Chris Bourque had made the Washington Caps roster. Not so fast. The Caps placed him on waivers today and he was quickly snapped up by the defending Stanley Cup Champion Penguins and placed on their roster. The first of the major preseason polls is out. The USA Today/USA Hockey Magazine poll ranks defending national champion BU third, behind Miami and Denver and ahead of early season opponents Michigan and Notre Dame. The Terriers, however, received the second most first place votes, 12, just one behind Denver’s 13. Full poll. “The juniors and seniors take care of us kind of like parents. They're great examples for us." 2011 recruit Cason Hohmann scored his first USHL goal as the Cedar Rapids Roughriders won the USHL Fall Classic. 2010 recruit Charlie Coyle’s 6-point performance for the South Shore Kings earned him the EJHL Award for top rookie in the season’s first week. In Sunday’s Junior Bruins Shootout, he had a hand in five of the Kings six goals (1-4-5), bringing his totals to 5-10-15 in 5 games, tops in the EJHL. Former BU Associate Head Coach David Quinn, who assumed the top job for the AHL Lake Erie Monsters this past summer, earned his first pro coaching victory on Saturday, a 2-1 win against Rochester. The Monsters’ first goal was a one-timer by former Terrier Kevin Schaeffer, who had been signed by the ECHL Charlotte Checkers, but was invited to the Lake Erie camp. The game-winner was scored by former BC captain Brock Bradford. Chris Bourque has earned a spot on the Washington Caps' opening game roster. Bourque, who had 73 points for AHL affiliate Hershey last season and made eight starts for the Caps, clinched his roster spot scoring a goal in Washington’s 4-3 win against the Rangers on Sunday. The Caps open the season in Boston on Thursday night. 2006-07 All-American goalie John Curry will begin his third pro season with AHL Wilkes Barre-Scranton after being assigned by the Penguins. He’ll find a familiar face in the Baby Pens’ defense corps, Brian Strait, who is in his rookie season. John Hynes, the former NTDP head coach is also in Wilkes Barre as an assistant coach. David Vander Gulik was assigned by the Flames to its new AHL affiliate, the Abbottsford Heat where had a goal (video) and two assists in the team’s exhibition opener on Saturday, a 5-2 win against Manitoba. Vandy, who appeared in six NHL games with the Flames last season, scored his second goal the next night as the Heat completed a sweep of the Moose, 6-4, and earned first-star honors. BU has received verbal comitments from a pair of slick, puck-handling defensemen from the U.S. NTDP—Adam Clendening (photo) and Alexx Privatera. They follow in the footsteps of Terrier blueliners who honed their skills with the U17s and U18s, including Brian Strait, Kevin Shattenkirk, Colby Cohen, David Warsofsky, Bryan Miller, and Freddy Meyer. Joining BU’s 2010 recruit class is Clendening, a 5-11, 187 lb., right-shot from Niagara Falls, N.Y., who began last season with the U17s, scoring 14 points (1-13) in 39 games before being called up to the U18. He added five more points (1-4) and helped Team USA earn a gold medal in the World U18s. Prior to joining the NTDP, Clendening was a standout for the Toronto Marlies Minor team, scoring 4 goals and 33 assists in 50 contests. 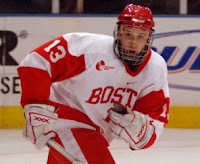 In a Niagara Gazette feature last Spring prior to the World U18s, Clendening indicated his interest in playing for BU. USA Hockey feature on Clendening. Privatera is BU’s second 2011 recruit, joining Cason Hohmann. A 5-10, 178 right-shot from Old Tappan, N.J., he joins the U17s after playing last season for the North Jersey Avalanche and Bergen Catholic, the high school team that former Terrier Matt Radoslovich led to a New Jersey state championship. His Bergen Catholic teammate, Ian Spencer, has verballed to Vermont for 2012. Privatera had an 8-24-32 line in 20 games for the Avalanche Midget 16s. Our friend Paul Shaheen of AHR has provided scouting reports on Privatera and a feature article written last November. Scott Weighart’s account of the Terriers’ march to the NCAA title, Burn The Boats: A Seven-Championship Season for Boston University Hockey, has gone to the printer. The author reports he is hopeful that the book will be available at Agganis Arena for the Oct. 10 exhibition game with the U.S. NTDP U18s and the banner-raising ceremony. The plan is for the books to be sold by the Friends of BU Hockey at a special table at Agganis Arena, similar to what was done with the "Starr of the Game" bracelets last season. Printed in a 6 x 9 format, the book is 240 pages including a 16-page photo spread featuring the photography of Dominick Reuter, Gil Talbot, and Josh Gibney. The book will sell for $17. For each copy sold at Agganis Arena, $7 will go directly to the BU hockey program--$1 for each of the team's seven championships last season. BU recently announced that all FOBUH donors at the "Terrier Club" level or higher ($300 or more) will receive a free copy of the book. A special website for mail orders will be set up soon with a link from goterriers.com. We’ll post further details when available, along with an excerpt from the book. In addition to chronicling the Terriers’ game-by-game performance, the book offers a behind-the-scenes glimpse at life in the locker room as well as various "moments of truth" not previously known to the public. Weighart says he is very pleased with the final product and eager to get it into the hands of the players, coaches, and fans of the program. ► Terrier Captain Kevin Shattenkirk is ranked #27 in the new Hockeysfuture.com list of 50 top prospects. ► 2009 Hobey Baker winner Matt Gilroy has earned his first pro recognition. He’s been named recipient of the 2009 Lars-Erik Sjoberg Award for the Rangers' best rookie in training camp. Gilroy was back on the ice last night and during an interview between periods, he narrated a clip of the game-tying goal from the 2009 National Champions and talked about facing the Caps' Alexander Ovechkin. ► Chris Higgins, in the Syracuse Crunch camp, knows that yesterday’s opponent is today’s teammate. Former Miami Red Hawk defenseman Kevin Roeder and Higgins are now wearing the same colors, and at the urging of the Syracuse Post-Standard, each of them reflected on the 2009 National Championship game from decidedly different points of view. ► Former Terrier and NHL standout Tony Amonte's induction into the U.S. Hockey Hall of Fame will be held in Boston on Dec. 1, 2009 at the Westin Boston Waterfront. Details & ticket information. Amonte video clip. Continuing his effort to land a spot on the Rangers' opening roster, Matt Gilroy spoke with the media (video) about his first pro training camp. The Daily Free Press reports on his early success in exhibition games. John McCarthy, who has been in the San Jose Sharks training camp, will begin his first pro season much closer to home with the Shark's affiliate in Worcester, Mass. He's one of five Bay State natives on the AHL club's roster. Another former Terrier captain, Sean Sulivan, returns to the Coyotes' AHL club, the San Antonio Rampage, where he played last season. A pair of Terriers from the North Shore, Jason Lawrence and Brian McGuirk, are on the roster of the Bruins' affiliate in Providence. Lawrence had been an invitee to the Bruins' training camp. McGuirk previously was Blue Jackets property and had skated for Syracuse last season. The Boston Globe's Kevin Dupont reports that if Chris Bourque doesn't make the Washington Caps' roster out of training camp, he likely will be traded. 2010 recruit Charlie Coyle had a six point night (3g, 3a) in the South Shore Kings' 8-1 win against Capital District Selects. After earning a spot on the Hockey East All Rookie team in 2007-08, defenseman Kevin Shattenkirk emerged as one of college hockey's top blueliners during the Terriers' national championship season. A seven-goal, 21-assist season gave him 49 points in his first two years in Scarlet. He was named AHCA Reebok Second Team All-American, Hockey East Second Team All-Star and a New England All-Star. The Colorado Avalanche's top draft pick--and 14th overall-- in 2007, he was second in the nation last season in plus-minus with +29. Shattenkirk also served an alternate captain for the U.S. 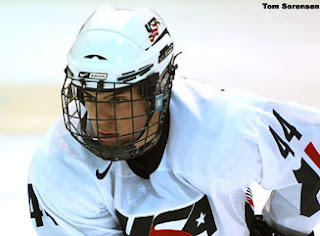 Junior National team in the 2009 World Junior Championships where he was named one of Team USA's three best players. Shattenkirk photo gallery. Captain of the 2009-10 Terriers, Shattenkirk answered a battery of questions for The Terrier Hockey Fan Blog. Q—Kevin, you’ve been selected as BU’s first junior captain since Jack O’Callahan (77-78)—who also won a national championship. Have you reflected on importance of that distinction? KS—I have obviously thought about being a captain as a junior. Seeing my name mentioned in same sentence as someone like Jack O’Callahan is such an honor and hopefully I can be as successful as he was at BU. It is going to be a challenging year, but I know that we have the team to do something special again and I plan on leading everyone the best that I can. Q—Watching your game change over the past two years, it appears that your gap control has become much better. Was this a conscious change or has it been instinctive as you have gotten better defensively? Do you change that gap depending on the forwards on the ice? KS—I think when it comes to gap control confidence plays a huge factor in getting better in this area. The coaches pushed me out of my comfort zone freshman year and, although I struggled initially, it was a matter of trying again and again. Eventually you adjust to the speed of the college game and become aware of who you are defending and take it from there. Q—What did you learn from last year’s captains--John McCarthy and Matt Gilroy? KS—Both Johnny and Matt had different approaches when it came to being captains. John was more of a silent leader, worked hard every day and set great examples for the team. Matt was definitely more vocal and confident in everything he did, which I feel is crucial as a captain. Q—With Gilroy graduated and Brian Strait also gone, do you expect to find yourself on the ice more often in critical defensive situations this season? KS—I believe that you have to earn a chance to play in those situations. My defensive game is much better and I feel I’m ready to take on that responsibility this year. Q—Team chemistry and unity of purpose were important factors in BU’s success last season. The upperclassmen were able to get the freshmen and sophomores to understand the level of commitment needed to have a successful season. As captain, how are you approaching this season? Will you try to duplicate the approach used by Matt and John last year, or are you and the assistants approaching things differently? KS—Our approach this year is similar to last year’s team but we are still making sure that we form our own identity. We only have nine upperclassmen so we are pushing the younger guys because we know how crucial they are going to be for our team this year. Like I said earlier, I believe we have a great team again this year and we plan on repeating our success from last year. Q—You’ve already been a successful captain, leading the USA U18s to a silver medal in the 2007 World Championships. How would you describe your leadership style? KS—I like to gain the respect of my teammates by setting a good example on and off the ice. I am not a guy who berates guys but I definitely hold every player accountable to perform his role, myself included. Eric [Gryba], Nick [Bonino], and I have a great balance of leadership styles that I think will work well. Q—A few questions regarding the blind drop-pass you made to Colby Cohen that led to the game winning goal vs. Miami. Everyone is familiar with Barry Melrose’s post-game comment: “Shattenkirk walking, he makes that drop pass. Very dangerous play. Only skilled guys will do it." a. Is the purpose of the play to confuse the defense and give Colby an opening for a clean shot? KS—That play is one that has two options. If my guy hesitated and stayed with Colby, it gives me a clear lane right down the middle. If he stays with me like he did, then it leaves Colby open. b. If memory serves correctly, you ran that play a few times earlier in the season. Any concerns that opponents may catch on and steal the pass for a breakaway? KS—We love that play because we both have a great feel what the situation calls for. If a player decides he might cheat on the drop pass then guy with the puck has a great scoring chance. It is kind of a win-win for us. KS—Not really. To be honest, Colby and I were never really partners because we just didn’t work. Whatever has clicked over the last years has been great because we play so well together now. d. Have the coaches put limits on when you can use that play and when you can't? KS—Our coaches have never limited our creativity, which is one of the benefits of playing here. They always preach offense off of defense; so, as long as we take care of our d-zone duties, we have the freedom to do what we can offensively. Q—Do you expect it to be a challenge to keep the team focused on the goals BU has every season—Beanpot, Hockey East title, NCAAs—without letting the totality of last year’s success become a target too lofty to duplicate? KS— do think that last year’s success will be in the back of our minds, but if anything it is a reminder of how hard you have to work to achieve those goals. We have all trained hard in the off-season and have come back to BU with a new attitude. Q—What are your thoughts on the three incoming freshmen defensemen. You’ve played before with Ben Rosen, right? KS—I have played with Ben and Sean Escobedo before, and Max Nicastro actually has the same family advisor. So as a whole I have developed a relationship with them before they arrived here. Each guy brings something different to the table and it will be interesting to see who plays because they all have the ability to play. Q—Do you spend much time thinking about your future pro career, especially now that Brandon Yip signed by the Avs, David Quinn is their AHL affiliate coach, and with teammates Colby Cohen and Kieran Millan also were drafted by Colorado? KS—My ultimate goal is to play in the NHL, so I definitely think about my future career. There are plenty of BU alumni and players associated with Colorado, which is always refreshing to know, but I can’t control what the future brings. What I can control is here at BU, so that is the main thought in my mind. Check out the newest link in the sidebar to the right: “Terriers in the NHL” It’s a page from a terrific site, Legends of Hockey.net that lets you look up any NHL player, past or present by team. This particular page lists all former Terriers—alphabetically from Peter Ahola through Scott Young—who have played in at least one regular season NHL game with a link to each one’s pro and amateur stats. The Blackhawks have sent former Terrier linemates Pete MacArthur and Boomer Ewing to their Rockford/AHL affiliate. Ewing was the top rookie in the ECHL last season. And—here’s one we missed last spring—MacArthur was voted top rookie on Rockford for 2008-09. David Van Der Gulik is in his fourth pro camp with Calgary, for whom he appeared in six games last season. If the Flames should return him to the AHL, he’ll be in familiar surroundings as Calgary’s affiliate has moved from Quad City to Abbotsford, B.C., which is VDG’s hometown. Matt Gilroy had another solid performance in the Rangers' 5-2 win against the Bruins, breaking up a 3-on-1 rush and creating offensive opportunities. He deserved an assist on NY's fourth goal. It was Gilroy's first game in TD Banknorth Garden since BU's 1-0 win the Hockey East Championsip game. 2010 recruit Charlie Coyle picked up a goal for the South Shore Kings in their 8-2 pre-season win against Capital District in EJHL play. Check back later today for the first Q&A interview of the season: Terrier Captain Kevin Shattenkirk. Chris Bourque had an assist in the Capital’s exhibition win over Buffalo. Dan Lacouture, a free-agent invitee to the Rangers' camp, was assigned to Hartford/AHL. Matt Gilroy followed up his solid performance on Tuesday night with an even better one Wednesday night against the Devils at the Prudential Center, registering the Rangers’ first goal and later scoring in the shootout. The Rangers lost, 3-2 SO, despite Gilroy’s efforts. Joining a Ranger rush early in the third period, he took a pass, sped past a defenseman and beat former Brown goalie Yann Danis with a quick backhander. He beat Danis again in the shootout for a 1-0 New York lead, but Zach Parise answered immediately and Travis Zajac won it for New Jersey a few rounds later. As he did Tuesday, Gilroy frequently was involved with the offense in transition, while producing a more thorough effort in the defensive zone. ►Colin Wilson, BU’s other Hobey Baker Award finalist last season and USA Hockey's College Player of the Year, continues to impress at Predators camp and is at the top of the list rookies to watch compiled by SI.com’s Darren Eliot. The buzz at Nashville's training camp is about Wilson's readiness to be the team's third-line center. The Tennessean looks for answers from the Predators' GM and coach. ► Brian Strait was assigned to the Penguins’ AHL affiliate in Wilkes Barre/Scranton where former Terrier and NTDP coach John Hynes is now an assistant. ► Brandon Yip survived the initial roster cuts in Colorado, but Shawn Bates was released. BU has announced that the raising of the NCAA championship banner will take place prior to the Oct. 10 game against the U.S. NTDP U18 team. It was originally set for the Oct. 20 game against Notre Dame. Head Coach Jack Parker discussed the reasons for the switch. Daily Free Press coverage. ► You know the season is right around the corner when predictions of the top teams start flowing. CHN’s Joe Edwards pegs the Terriers for third, behind Denver and Miami. Like Scott Weighart's soon-to-be-published book, Burn The Boats, the 30-minute DVD begins with the loss to Vermont that ended the 2007-08 season and tells the compelling story of BU's record-setting season. All together, it features highlights from 33 games. The first 15 minutes are devoted to the regular season, including nearly all home games plus wins at UMass, Lowell, BC, Denver, Northeastern and the Beanpot. The remaining 15 minutes thoroughly cover BU's nine post-season games from Hockey East quarter-finals through the national championship game and the victory celebration in Boston at Marsh Plaza. For more information, contact BUhighlights@gmail.com . ►Matt Gilroy made his first professional start tonight in the Rangers-Bruins exhibition game at Madison Square Garden. Wearing #97 and paired with Marc Staal, he played a solid defensive game and wasn't shy about jumping up into the offensive zone. No points in the Bruins' 2-1 win, but he impressed the TV game analysts. Matt Gilroy, the 25 year-old first-year defenseman who won the Hobey Baker Award at Boston University last season, impressed the staff with his willingness to lead the rush up ice and create offensive opportunities. Although he did not score, Gilroy did whistle a shot past goaltender Henrik Lundqvist and off of the crossbar in the morning scrimmage. Gilroy is in a spirited battle with no fewer than a half dozen defensemen, ranging from youthful former first round picks Bobby Sanguinetti and Michael Del Zotto to NHL veteran Alexei Semenov -- who is in camp on a tryout basis -- for two or three spots on the backline. 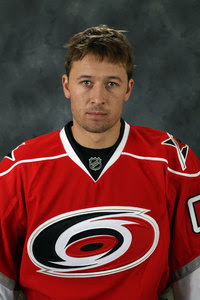 ►A third ex-Terrier in the New York camp is Dan Lacouture, a free agent invitee who played in Carolina and Albany last season before finishing up in the Russian KHL. ►In Duluth, Georgia, today, Colin Wilson scored second professional goal in two days and added an assist in a Predators 3-0 rookie game win against the Thrashers. Yesterday, he scored his first goal in a 6-3 loss to Atlanta. ► After participating in Penguins rookie camp, Brian Strait skated with the veterans Sunday—before a crowd of 3,500. “It was a tough practice. You see the work ethic the NHL guys bring everyday and you just try to emulate that,” Strait said. ► The ECHL Charlotte Checkers have signed former BU winger Kenny Roche, who played for the Lausitzer Foxes in Germany last season. He joins his Terrier teammate Kevin Schaeffer who signed with the Checkers last week. As reported earlier this summer, future Terriers Robert Polesello (2012) and Cason Hohmann (2011) both had played for the East Coast Selects tournament team program. It's an impressive entry on their hockey resumes that they share with five current Terriers who are also are ECS alums. 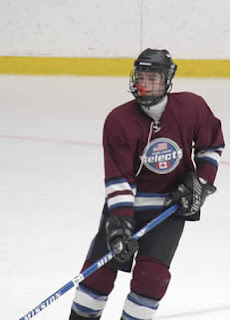 Three defensemen, Colby Cohen (photo), Kevin Shattenkirk and Ben Rosen played for the Selects’ 89 teams, while Corey Trivino and Alex Chiasson skated for the Selects '90s. The three then-future Terrier blueliners were joined on the ‘89s by former BC defenseman Nick Petrecki and Harvard’s Alex Biega leading ESC to several tournament wins. They also won the 2004 Mission Cup (team photo), although Shattenkirk didn’t play in that event. The ESC site has photo features on the career development of both Shattenkirk and Cohen. ►Brian Strait, who is completing Penguins rookie camp before joining the Pens veterans this weekend, was quoted on the Stanley Cup champs’ Web site about his expectationsfor his first pro camp. Strait wore #2 in a Kitchener Propsects Tournament game against the Bruins. 3rd period video. Earlier in the game, Strait fought with the Bruins’ Scott Fletcher. ►Former BU defenseman Kevin Schaeffer has signed on with the ECHL Charlotte Checkers, a new affiliate of the Colorado Avalanche. Schaeffer, who spent most of last season with the Providence Bruins, will attend the AHL Lake Erie Monsters training camp where David Quinn is the new head coach. ► The Denver Post spoke with Brandon Yip following the completion of Avalanche rookie camp. ► Fifth-year pro Chris Bourque is back in Washington Caps training camp hoping to stick with the club. He made eight starts for the Caps last season. ► Chris Higgins, who impressed the Blue Jackets' coaches at the Traverse City Prospects Tournament, now enters Columbus's full training camp. On the 8th anniversary of the 9-11 attacks, we remember former Terrier Mark Bavis, twin brother of BU associate head coach Mike Bavis, who was on United Airlines flight that crashed into the South tower of the World Trade Center. Bavis, then an L.A. Kings scout, was traveling with former Bruin Garnet “Ace” Bailey, the Kings’ director of pro scouting. Bavis was a hard-nosed forward who played on three final four Terrier teams, and twice shared the Bennett McInnis Memorial Award for Team Spirit with his brother. A Rangers draft choice, he later was an assistant coach at Harvard. The Bavis family founded The Mark Bavis Leadership Foundation was created "to perpetuate the principles by which Bavis lived every day, and through which he touched the lives of many. The foundation will provide selected young men and women with annual grants ranging from $1,000 to $5,000 to be used for school tuition, summer programs and other appropriate extracurricular activities. " For more information: Mark Bavis Leadership Foundation, c/o Merilyn Sullivan, 90 Cambridge Road, Woburn, MA 01801. Two days after that tragedy, U.S. Hockey Report related the narrow escape of former BU defenseman Mark Krys, a teammate of the Bavis brothers, who was in the World Trade Center when the planes hit it. Mark Krys, a defenseman for Boston University from 1987-91, was on the 44th floor of the World Trade Center's south tower when it was hit by highjacked United Airlines Flight 175, the same plane that carried Mark Bavis, a former Terrier teammate, to his death. Krys, a 32-year-old native of Timmins, Ontario, spoke to the Canadian Press shortly afterward, saying that when the tower was hit, he had gone downstairs from his 60th floor office, where he worked as a trader, to get a cup of coffee on the 44th floor. "It was a coincidence," he said. "I was that much closer to the ground." "When the plane hit," said Krys, "it was really scary. I was just thinking, 'Let's get out of the building.' Krys bolted for the elevator. "I don't know if it was a smart thing," he said, "but I took it." When Krys, a 1988 8th round draft pick of the Boston Bruins who played ten years of minor league and European pro hockey, reached street level, he ran, his thoughts turning to his wife and three-year- old child. Eventually, he reached the ferry that would take him to New Jersey, where he lived. The Travis Roy Foundation will be featured during a half-hour program on NESN tonight, beginning at 10:30 p.m. The charitable organization, which assists spinal cord injury survivors and funds research, was named for and established by the Terrier forward who, in October 1995, suffered a spinal cord injury during his first varsity shift. Several members of last season's championship team are on the ice in pro rookie camps. Former Terrier co-captain John McCarthy, who signed with San Jose and picked up an assist in his first rookie game, was surrounded by familiar faces from Hockey East in the Sharks' line-up: Northeastern's Louis Liotti, UMass's Cory Quick, BC's Benn Ferriero and Nick Petrecki and Vermont's Dean Strong. Over in Centennial, Colorado, Avalanche rookies, including Brandon Yip, are being put through their paces by Avs' coach Joe Sacco and AHL affiliate coach David Quinn. Yip, the only player to score the game-winning goal in two Hockey East championship games, was featured in a Meet the Rookies column by Mile High Hockey. In this photo display, Yip is in shot #16 and Quinn is in shot #12. Colin Wilson, USA Hockey's 2009 College Player of the Year, began Predators' rookie camp yesterday and the Nashville Tennessean looks at his chance of earning the number three center spot to begin the season. Click here for a photo of Wilson taking a shot on rookie goalie Chet Pickard with whom he grew up in Winnipeg. The Colorado Avalanche announced its 59-man training camp roster and as expected, recent signee Brandon Yip will be there, sporting jersey #59. He began rookie camp today. The Avs on-ice staff is led by new head coach Joe Sacco and includes the new coach of the Avs’s AHL affiliate, David Quinn. Also on the roster is pro invitee Shawn Bates, the former BU standout center and member of the 1995 national champions (video). 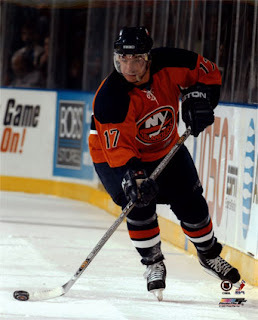 Bates, a veteran of 465 NHL games, played for HIFK Helsinki last year after two injury-plagued seasons completed his six-year stint with the Islanders. Here's a clip of Bates scoring on a penalty shot against Toronto's Curtis Joseph in the 2002 Stanley Cup playoffs. NHL.com’s Rookie Watch looks at Matt Gilroy’s chances of making the Rangers’ roster in his first pro training camp. We've added a few more assessments of Terriers from Hockeysfuture.com's lists of NHL teams' top prospects: Junior defensemen Kevin Shattenkirk and Colby Cohen (Avs) and freshman Alex Chiasson (Stars). Click here. Former BU winger Ryan Weston, who played for the Albany River Rats last season, has signed on with the ECHL Las Vegas Wranglers, a team known for staging creative game promotions. Last year, the team held “Governor Rod Blogojevich Prison Uniform Night,” with Dan Spang, then a Wrangler, and Tom Morrow among the participants. Spang will play in Germany next season with the Nurnberg Ice Tigers. Former All-Hockey East defenseman Bryan Miller has returned to the Alaska Aces for a third season with the ECHL club. Last year, Miller had the best scoring totals of his four-year pro career with a 10-30-40 line in 61 games. He also played in six games for the AHL Providence Bruins. Amidst all the team and individual achievements of the Terriers’ NCAA championship season, here’s one that we overlooked last Spring. Nick Bonino led the nation in plus-minus with a +29, edging out classmate and 2009-10 BU captain Kevin Shattenkirk, who was +28. Gilroy is very fast, confident with the puck, and sees the lanes very well. He can move the puck quickly, but doesn’t panic with it. His passes are accurate and he also has a good shot. The combination of Gilroy’s offensive skills with his solid play in his own zone made Gilroy very impressive this week. Former BU captain and current New York Rangers captain Chris Drury was inducted into the Little League Hall of Fame in Williamsport, Pa., this past Sunday. When BU will plays the NTDP U18s in an exhibition game, on Oct. 10, a pair of highly-regarded prospects will get an in-game look at Agganis Arena and Terrier fans. The U18 roster includes right-shot defenseman Adam Clendening, who has expressed interest in BU and also is being courted by the London Knights. Left-shot forward Matt Nieto, another uncommitted U18 player, was among the U17s top scorers last season before being promoted to the U18s where he won a gold medal in the World U18 tournament. One of the top scorers at this summer’s USA Hockey Select 15 Festival was Brendan Silk, a cousin of former Terrier, Olympic gold-medal winner and NHL player Dave Silk. U.S. Hockey Report described Silk as a “Big power forward who can get up a head of steam. Strong on skates, and has good puck skills. Going to Austin Prep."